My statement that there is no such thing as a naturally cow-hocked horse often raises a few eyebrows, so I feel it is necessary to explain in detail the reasons for that opinion. The cause of this is flaring. The hoof capsule is flared to the outside heel and the inside hoof wall is upright and the inside heel is low or possibly even under run. The effects are disastrous for the horse. The horse has a less than happy attitude to work because he is sore in the back just forwards of the hips, he is probably developing hock soreness as well and if he is a race horse he will be speedy cutting and or brushing inside his fetlock joints. If he is a camp drafter he will be having trouble turning with the beast which means low scoring or elimination; show jumping or dressage or polo or polocrosse are all affected by the outside flare inhibiting the horse’s ability to turn on the hind quarters. The golden rule is that a hoof in flight will travel in the direction of its longest point and when it hits the ground it will point in that direction also. Even when observed at a walk, the cow-hocked horse’s hinds leave the ground and swing inwards, then half way through the stride they swing out, forming an S-bend, then when they land, they land on the outside heel first, then roll to the inside heel then as they load up, going forward they point outwards again. Just imagine the strain and forces that are occurring in the hoof while all this is happening in the blink of an eye. Common sense should tell us that the quickest way from point A to point B is in a straight line, not an S-bend. The horse’s rear end is its power pack but when viewed from behind, the cow-hocked horse is weak in the hind quarters; from the hip down there is no muscle bulge in the top of the thigh, but when the cow-hocked hoof is corrected, allowing the hoof to stand pointing straight forwards to the front hoof, the thigh muscle begins to bulge and will develop power again and performance. So the question is why do horses become cow-hocked? 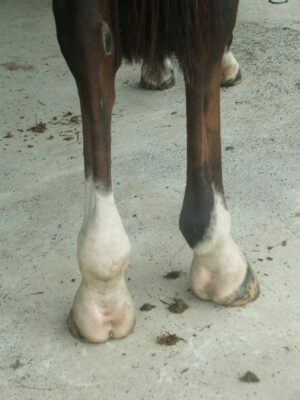 It all starts from foal age when the hoof capsule is soft at birth and the joints are very flexible and the leg has not developed any muscle; the hoof begins to bend and flare to the outside, both front and hind – this should be monitored and corrected at ten days old then checked continually thereafter. 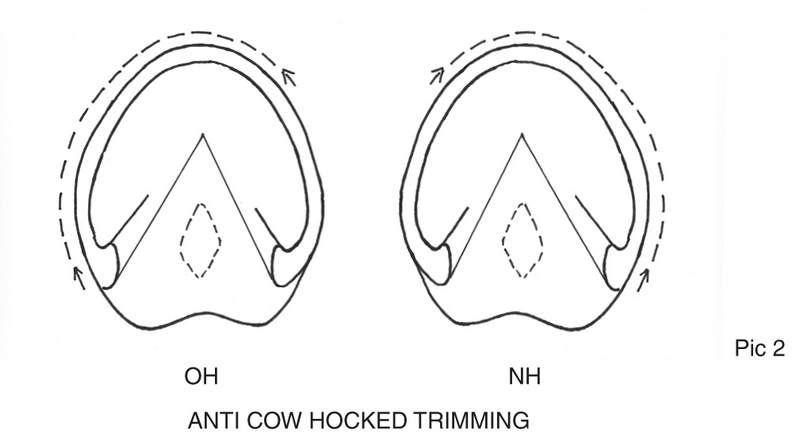 As described in the last article dealing with the effects of levelling the front hooves, the same principle applies to the hinds – the pedal bone centers itself under the knee (but in the hind leg it is called the hock) and it stays in that position, so if the juvenile hoof is not corrected it begins to flare, nearly always to the outside and then they will begin to stand cow-hocked. A flare anywhere in the hoof is our greatest enemy and must be corrected. V-shaped, an even length on both sides, level across the heels and T-squared with the back of the pastern, and with the sole correctly cleaned out to the junction of the hoof wall – this shape is readily obvious in the mature hoof. 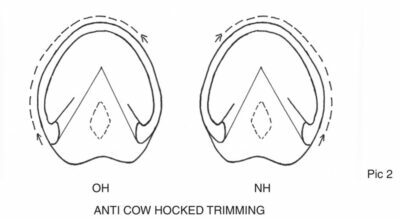 To avoid developing an outside flare in foals and most young horses up to the age of two years old, apply the anti-cow-hocked trim (Pic 2). When viewed from the bottom, lower the outside two thirds of the hoof wall, leaving the inside heel slightly higher which will cause the hoof to stand pointing straight; then as the horse develops rear end muscle the hoof can be levelled with no chance of an outside flare occurring. Sadly, so many people providing hoof care in these modern times have come to accept the cow-hocked stance as being normal, but it is not. An even bigger concern is that the modern horse shoe manufacturers are now producing left and right hind shoes to cater for this belief, and the unwary are using them in the belief that this profile is correct, but it is not. So we must ask ourselves who is leading who, and which came first, the chicken or the egg? So who is right? It is my belief that nature has always tried to show us the answer to that, but we just haven’t been diligent enough to see it and obey nature’s guidelines which are the pedal bone shape, the coronary band shape and the white line, and the resulting difference in performance when we eventually see and understand what we are looking at.